* Measures the volt drop as if 16A was flowing between Line and Neutral . * Displays voltage without current (V at 0A). * Display voltage as if 16A flows between Line and Neutral (V at 16A). * Loop test for L-E * PSC between L-N.
* Checks wiring integrity (LEDs). * Auto-off / auto-ranging (software range). 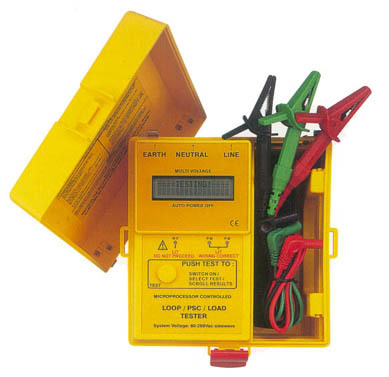 * Combined Prospective Short circuit Current, Loop and Load Tester. * Test leads, shoulder belt, user's manual. * 60Hz available on request. * Display can be customized for large orders. losses into the Line and Neutral impedances (losses due to the current circulating into theses impedances). The result of this dropped voltage is displayed as if you had a 16A load (V at 16A). 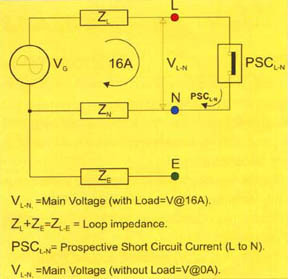 Loop Impedance between Line and Earth (Z L+Z E)=ZL-E and Prospective Short Circuit between Line and Neutral.